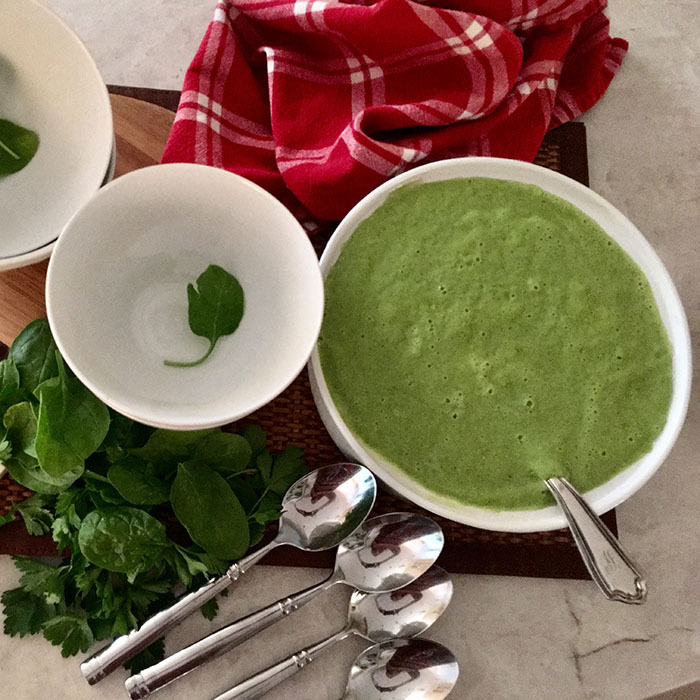 This soup is yet another quick and easy way to benefit from the uniquely rich nutrients found in spinach. It can be enjoyed as an appetizer, a go-to snack, or even your entrée! Sauté coarsely chopped scallions and coarsely chopped garlic in olive oil until they just begin to glisten (approximately 2 to 3 minutes). Transfer mixture to blender. Add spinach and vegetable broth and blend until almost smooth. Add avocado to mixture, and blend until smooth. You can always add more broth to reach the consistency of your liking. Salt and pepper to taste. I like to add turmeric to this soup, and to garnish with minced parsley. Spinach is another vegetable that has endless benefits! It's a great source of vitamins, minerals, phytonutrients, iron, calcium, zinc, magnesium...the list goes on. Spinach is extremely durable and easy to grow (in a garden or pot). With all these nutrients, spinach is something everyone should aim to consume daily (yes, daily!) - whether in a smoothie, salad, pesto, sautéed with garlic for a side dish, or in this and other soups.